Want to Improve Your Effectiveness? STOP doing things that are unrelated to the improvement of teaching and learning! Start doing more of the things that help teachers get better and students succeed! 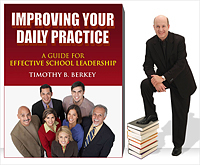 Once you reduce daily time invested in nonproductive school management tasks, it is important to establish new habits that are highly connected to effective school leadership. My Effective Leadership Tracker provides school leaders with a framework of research based practices associated with the improvement of teaching and learning. Each of the segments of the Tracker are made up of several subareas of leadership. Want to Learn More About High Impact School Leadership?